Not long ago GitHub and AWS together cross promoted a blog post about triggering new releases in GitHub by pressing an AWS IoT button. 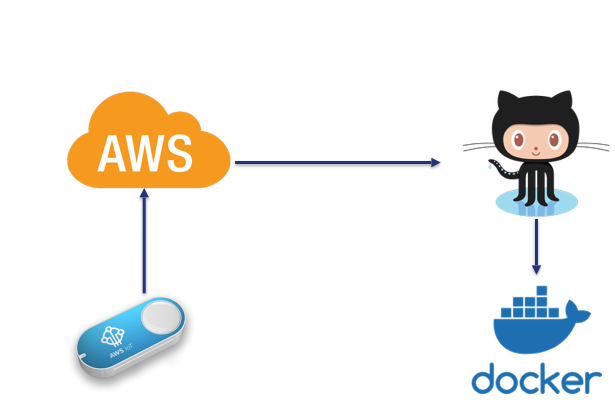 This new process got me thinking about how we can use an AWS IoT button together with Docker. After some research and jotting down my thoughts I had the ah-ha moment. What transpired after is a new way to think about how we can use IoT. We can turn the traditional IoT pipeline around and use a device itself to trigger our DevOps pipeline. The premise of this project is simple. Press the AWS IoT button with a result of building a Docker image automatically. 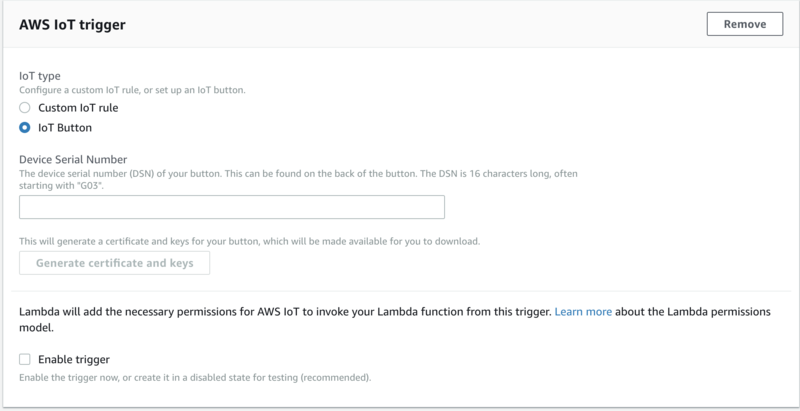 We can use an AWS IoT button to launch a Lambda Serverless function in AWS, which then creates a new release and tag in GitHub. This newly generated tag then fires a webhook to Docker Hub to start a new Docker build. How do we connect the different services and automate this workflow? Ah ha! That is what we want to find out. Before I get carried away, we should cover some of the basics. What is an AWS IoT button? I’m glad you asked. The AWS IoT button started its life as an Amazon Dash button. OK, another button? Yeah, the Amazon Dash button is a button that links a product from the Amazon store like shampoo or washing machine soap to the button. When an end user pressed the button, it would automatically order and ship the product from Amazon. Clever, right? The development community liked this button so much that they asked AWS if we can have a generic button which so we can develop our use cases. The AWS IoT button was born. The button is said to have 2,000 button presses before the battery dies and I don’t see an easy way to replace the battery, so it’s sure to be interesting when that happens. Configuring the AWS IoT button is straightforward. We need to set up a GitHub repo to connect to the AWS Serverless Lambda function. The information in the repo is for the configure AWS & Lambda steps of the installation. As a starting point Anisha Gupta did an amazing job building the Lambda which we use for this project. We reused the code made some small changes and then deployed Lambda. Install the Certificates & Key from the previous step on the AWS IoT button. With the power of the internet and webhooks, we link Docker Hub to GitHub. Docker Hub now is configured to watch our GitHub Repo for any changes. We configure Docker Hub specifically to look for any new GitHub tags. A new tag is created every time we press the AWS IoT button (Crazy, right?). We configure the build settings to create 2x Docker builds. The first Docker builds the newly created version/tag available in GitHub and the second build is the latest tag. 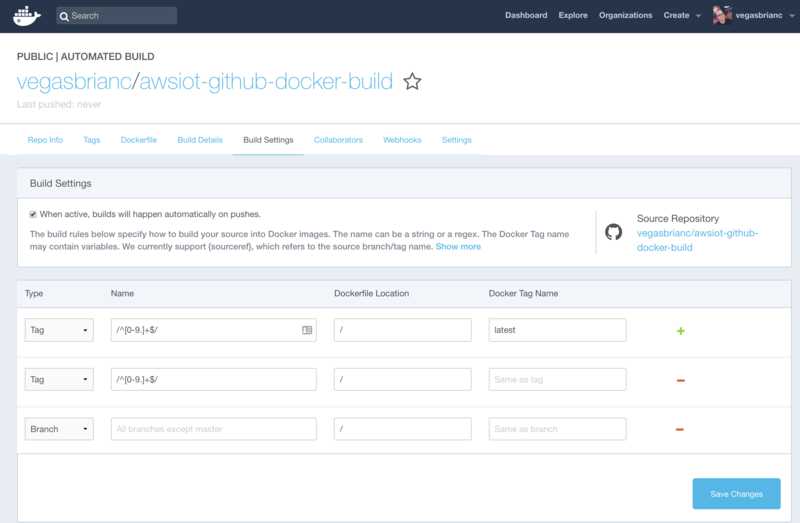 Navigate to the Build Settings inside the newly created Docker Hub repo. Click the green plus sign to add another build setting. Our DevOps pipeline is now configured and ready for some action. Before we get started, we need to make a change to our repo, so we have a difference in code base between version 1.0 and 2.0. It’s easier than it sounds, no worries. Test version 1.0 locally to see what displays. Next, update the Dockerfile, commit our code to GitHub, and finally press the AWS IoT button to trigger the Docker build. We combined the all the commands needed to create your new Dockerfileand push it to GitHub. Copy the below command snippet and paste into your command prompt which will execute all the commands. Be sure to change your GitHub username in the GitHub URL! git commit -m "My Release will be called X"
The Repo is now available with a different Dockerfile. Let’s now trigger the pipeline to create a new release based on this. Open your GitHub repo and open the releases tab This is the demo repo but you should navigate your repo, and we should now see a new version just created. 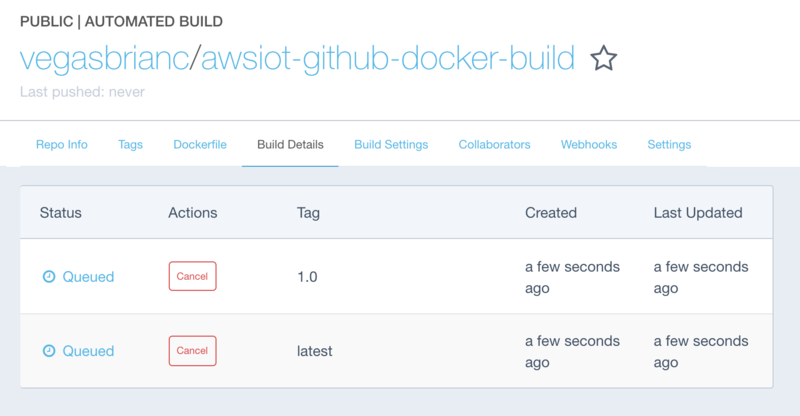 Monitor GitHub until the new release appears then navigate back to Docker Hub and click the build details tab. We should now see two builds running latest and a new version. Amazing! Wow, we just turned an IoT button into a DevOps pipeline trigger. Just one of the many use cases. Imagine your next software release triggered by the press of a button. The use cases for the AWS IoT button or IoT, in general, continues to grow. Hardware continues to look more like software and adapt to web standards the entry point for new developers continues getting easier. Rest assured that this is not the last time you hear from our AWS IoT button. More projects in the “Pipeline” so to say.